The story found in Surah al-Baqarah in ayahs 67-73 is one that encapsulates the relationship between Musa (as) and the Children of Israel. The hardheartedness of the companions of Musa (as) did them no favours, for had they submitted their dunya and akhira (this world and the next), it would have been much better for them. Instead they suffered, by Allah (swt) making a simple task one much more difficult and expensive! The following hadith from Imam al-Ridha (as) describes the events and comments on the ayahs, ending the story with a young man from Bani Israel who showed how submission to the laws of Allah (swt), a soft heart, and kindenss, can lead to success both in this world and the next. Grading: The hadith is Sahih/Authentic (صحيح); al-Mohsini says that it is a Mu`tabar (reliable) hadith [Mashra`at Bihar al-Anwar, Volume 2, Page 369-370] (See Second Image below); We also look at the narrators of the hadith by the standards of Sayed al-Kho’i (rh) through the following chain: al-Sadooq -> His Father -> Muhammad ibn Yahya al-Attar -> Ahmad ibn Muhammad ibn Isa -> Ahmad ibn Muhammad ibn Abi Nasr al-Bezanti -> Abul Hassan Al-Ridha (as). 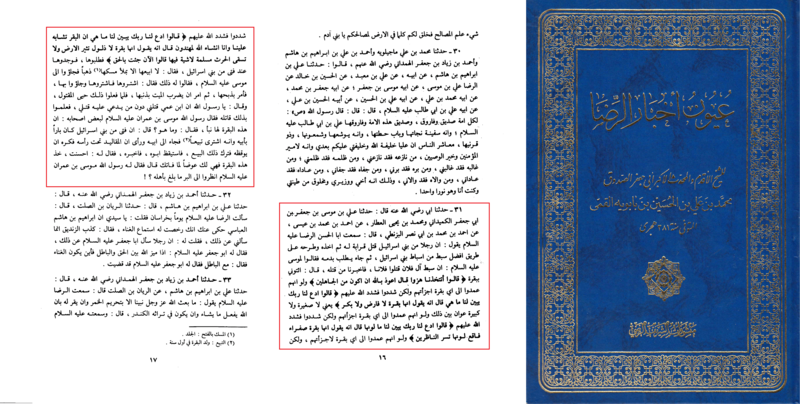 We find, via al-Mufeed min Mu’jam Rijaal al-Hadith (See Third Image below), that all narrators are reliable and is a Sahih Hadith.